There's been a great deal of chatter recently about the pecking order of American cities - especially how globalization continues to reinforce the dominance of certain first-tear "capitals" while compelling other cities to compete ever more aggressively. Most of these posts argue that the last decade has witnessed the relative rise of Washington D.C., which Aaron Renn contends has come largely come at the expense of Chicago and L.A. This is a complex and awkward argument simply because the history, culture and economic nature of L.A., Chicago and Washington D.C. are extremely different. They exist for very different reasons. Los Angeles is a cultural capital that is largely defined by the entertainment industry, shipping and industrial production (L.A. is actually the largest manufacturing metropolitan area in America, Chicago is second). Though it lacks the cultural influence of L.A., Chicago is a far more important global business hub with a much higher concentration of major corporate headquarters and global service industries (lawyers, business consultants, etc.). In many ways Chicago remains the central of hub of the America's transportation network (rail, road and air travel). Studies also consistently find Chicago to have the most balanced overall economy in the United States. Washington D.C. is still undeniably tied to the Federal Government. Every major corporation has offices in D.C. but the companies themselves (and the majority of their productive work) are still centered in cities like New York, Chicago and the Bay Area. While other capitals like London, Paris and Tokyo evolved as business and cultural centers as well as seats of national government, Washington was planned from the beginning as a separate government satellite. In many ways it remained a relative backwater until the 1930's and 40's (the New Deal and World War II). Washington's dramatic growth in the last decade was caused largely by the exponential growth of corporate lobbying and government related sub-contracting (not an expansion of federal employee's as others would have you believe). De-regulation and privatization has thus facilitated an unprecedented flow of corporate money to Washington in order to influence national policy. In this context, our Federal Capital is more like a specialized satellite or "Edge City" of Wall Street than an independent and economically diverse metropolis. The "rise of Washington D.C." isn't some kind of competitive miracle - it still has more to do with Federal policy and lobbying than anything else. 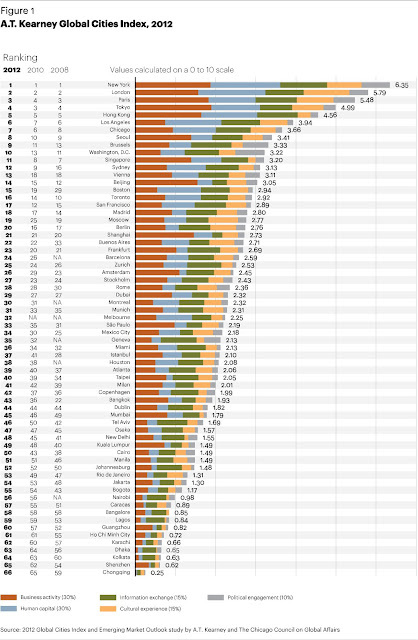 Ironically yesterday yet another ranking of global cities was released showing that, by a number of measures, Washington D.C. is still well behind L.A. and Chicago in cumulative importance. In fact, removing government influence would bring Washington well below Boston, San Francisco, Toronto and Montreal in global influence. So what, exactly, prompted Renn and others to suggest that D.C. is now America's "Second City." My guess is that this has as much to do with the increase of wealth and attention in the D.C. area as it does with any real competitive value. The Capital now has, unequivically, the highest per-capita income in country. Corporate wealth has gained unprecedented power and influence over the Federal Government, the national media and common perception. Despite the supposed leveling effects of digital media and internet technology, culture and media have only become more concentrated in the New York - D.C. corridor over the last 20 years. The nation's newspaper industry is largely dead. Local, in-depth reporting is scarce. News itself - especially televsion news - has become little more than another form of entertainment. More than ever America's attention revolves around the reality show of Manhattan, the Beltway and to a lesser extent the Los Angeles - San Francisco axis. These places define our expectations and aspirations. They create perception. They influence how people in Kokomo, Indiana feel about themselves (hence a highly effective conservative backlash). Hyper-concentration of perception breeds distorted perspectives, myopia, ignorance and ultimately irrelevance. Highly concentrated wealth and media may thus elevate a city's global status while simultaneously making it incapable of acknowledging (much less understanding or resolving) the real challenges of our time. Some have recently suggested that one of the reasons Congress seems so utterly disconnected from reality is that D.C. is itself a bubble of wealth and prospertiy in a country full of adversity. The same would certainly be true for Manhattan, where 12% of America's 1% (not to mention untold numbers of the world's wealthy) currently reside.